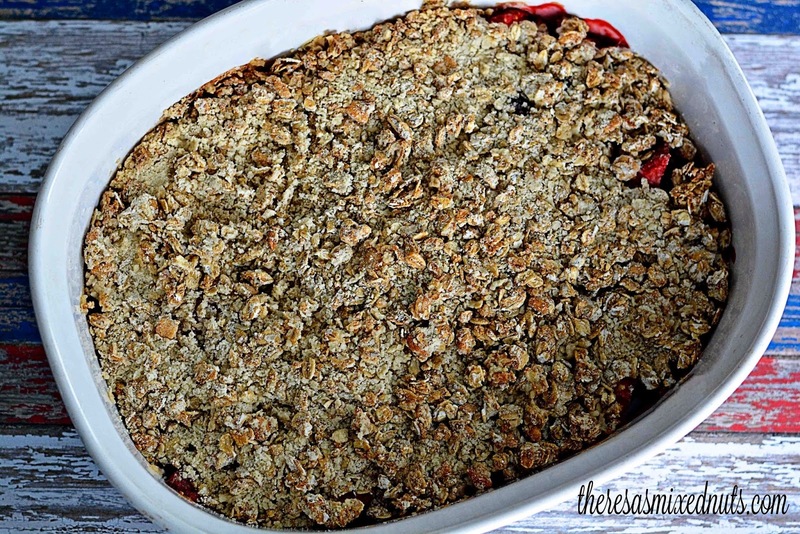 Theresa's Mixed Nuts: Strawberry Blueberry Crumble! Happy Spring, ya'll! Did you think this day would ever come? Me either! But it's here, and that means it's just a weee bit closer to summer. Now that the warmer seasons are upon us, we've had some good looking berries grace our store shelves recently, and I have been snapping them up every chance I get. I kind of went overboard on the strawberries last week, so I went to my trusty Golden Blossom Honey recipe page to see what I could make with them, and zeroed in on a Strawberry Blueberry Crumble recipe. This recipe had me dreaming of warm, sunny days, and sitting out in the yard with family and friends sharing a delicious dessert. I ate mine plain, but it would be perfect scooped over some vanilla ice cream, or even layer it with whipped topping for a scrumptious parfait! Would you eat the crumble as is, in a parfait, or over ice cream? Yes! We do love them blueberries! Yes, we do. It's funny though that they're called blueberries (no, Dezzzzzz.... not Blue's berries!) while clearly they should've been called purpleberries. Do you reckon the person who invented the not-so-very apt name was color blind? love the strawberry and blueberries...they are good for cancer patient like me :)..thanks for sharing it, Theresa.. It's such a delicious combination, isn't it Indah!? One of my favorites and full of antioxidants! That does sound delicious Alissa! Jason is on a huge Greek yogurt kick lately, and I bet he'd love this mixed in for a lunchtime treat! This is beautiful. I bet it tastes great too. This looks really yummy. I wan to make this and add a scoop of Vanilla Ice Cream while it is still warm. Blueberries, strawberries and HONEY YUMMMMMMMMMMM. Yes-I know it is spring today so why is it snowing? Yikes! I think our snow is long gone *fingers crossed! * Hope yours melts soon! That sounds so yummy to me! Blueberries and strawberries work perfectly with granola and honey. I'd love to have this with ice cream! 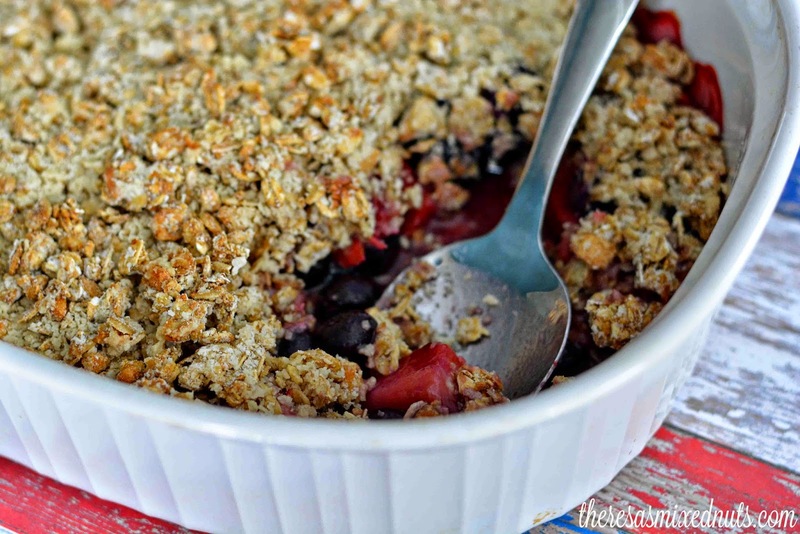 I love crumble with a passion, this is a recipe I really want to try! I wasn't signed in to my google account when I left my comment and google gods ate the first comment so I think you may get two comments from me. I think the crumble just needs some ice cream and I have never added strawberry and blurberry in a crumble it was always one or the other but I can see how this would taste great. I would love to make this for brunch one of these days. I think it would be a big hit. I'm not a big fan of blueberries but the kids sure do love them and this would be right up their alley. Thanks for the recipe. That looks so good! 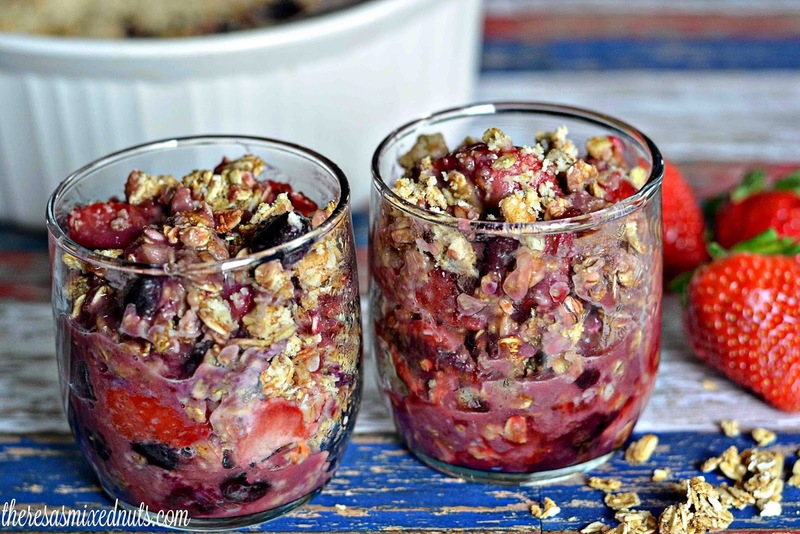 I love fruit crumbles, they're such a perfect dessert. I love fruit crumble desserts. They remind me of my grandmother. Now that looks so good. I love the combination of all the different flavors. Blueberries, strawberries, honey and cinnamon! Wow! This really is my kind of sweetness. I love crumbles and crisps with a big head of vanilla ice cream! That looks delicious! Warm out of the oven with a scoop of vanilla ice cream on top sounds good with it too! This looks awesome. I have never tried a recipe like this- I am saving this to make! This crumble looks so delicious. I'm sure it is high in antioxidants too. My goodness, this looks absolutely delicious & yummy. Both Strawberry & Blueberry are my all time favorites & I love how the combo has come out very well. I can't wait to make yummy spring dishes, this one looks amazing! I have not made a crumble in years. It is such a delicious desert. I will have to make one this weekend. I am sure the kids will love it. Oh my that looks amaaaazing!!! Feel like reaching into my computer to grab and eat it! I make something like this and we eat it for breakfast. Yours looks better than mine. that looks yummy! I tried this once and it did not come out right at all.